I am converting my Shiv Tri bike to Di2 and will be buying mostly Ultegra 6870 components. If I buy the SM -BCR2 charger/interface, the BT-DN110 battery and the EW – WU111 is there any need to buy the SM- PCE 1? Can the SM – PCE 1 do anything that the above combination cannot do? 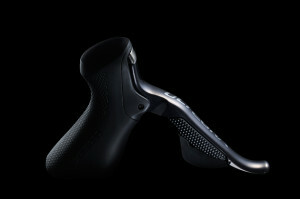 Do you know if the R671 Remote TT Shifter (two button) if compatible with EW – WU111? Can you control the Edge 520 in TT position? Thank! 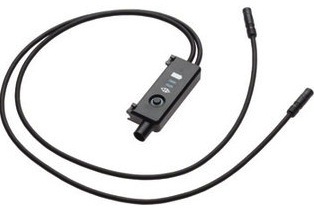 could you please help on how to upgrade my dura ace 9070 through E-Tube with SM-BCR2, a W10 laptop, SM-EW90-A, it is like it is not recognized after having installed everything? This should be a very straight forward process, but lets list the steps required. 5) Launch the app, E-tube_Proj_V_3_2_1.exe and follow the prompts to install. Note 1: The SM-BCR2 must be disconnected from the laptop while the installation runs. Note 2: This app requires the .NET Framework 3.5 SP1 component from Microsoft. Highly suggest this be installed before installing the E-tube app. 7) Connect your SM-BCR2 to the EW90-A and then to the laptop USB port. 8) Launch the E-tube Project app from your desktop. 10) The app will immediately start downloading all component updates, this is normal. Don’t worry, no updates are being applied to your components yet. 11) When the MENU appears, CONNECTION CHECK should be highlighted, click on this and let the app find your components. At a minimum, your EW90-A should be visible as long as the battery is connected and has a minimal charge. Once the Component Check is completed, you should see other options to help you with your Di2 system firmware updates and setup. I followed your instructions and it did finally work and was recognized all the components correctly. I did update to latest firmware. all correct! Semi-synchronized shift is a function that automatically shifts the rear derailleur when the front derailleur is shifted in order to obtain optimal gear transition. How should I set it up in order I get Semi-synchronized shifting?? There are 3 Shift Modes, Normal (manual), Semi-synchronized and Synchronized. Semi-sync – You control the FD and the RD will automatically shifts to maintain the best gear ratios. Synchronized – Allows shifting without duplication of gear combinations. You shift the RD as normal and the FC will automatically shift and with one control input to move the RD and optimize the shift. This is not like an automatic transmission, it’s just optimizing your shifts for best FD / RD changes. Within the e-Tube Project software, you can customize or select what each of the 2 modes will do. You can also customize the shifts (number of gears to automatically shift up or down). My recommendation is to accept and leave it at the defaults until you have worked with if for a while. If you have changed these settings, you can press the “Restore default values” option within the program. To change modes, press the MODE button on your cable junction box A (I use an EW-90). To change modes, press the button twice quickly to change modes, kind of like a double mouse click on a PC. The Green and Red indicator lights will flash to indicate which Shift Mode you have selected. The modes will cycle through, 0, 1, 2, then back to 0. 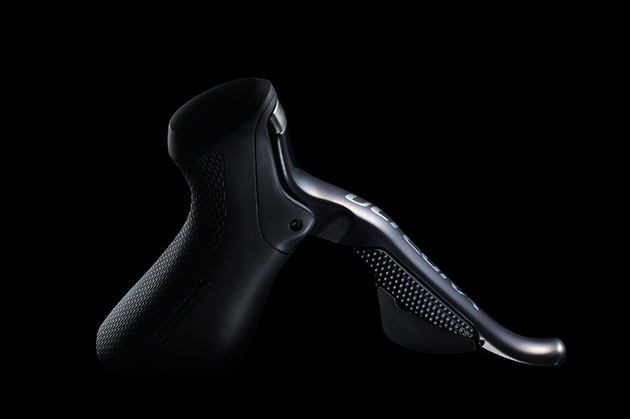 If you have the D-Fly installed on your Di2 system, the mode can be changed with the Smartphone App. I had a 200 kms sportive last weekend, la mussara in Reus Tarragona, and did not want to mess around just in case…but will definetely try it tomorrow, and let you know. I also have the SM-EWW01 ANT Wireless Broadcast Module: so not bluetooth capable. I did push the button twice quickly to change modes, kind of like a double mouse click on a PC and The Green and Red indicator lights did not flash to indicate which Shift Mode I have selected. You should not do it on the e-tube software? Setting the Shift Mode via e-Tube software or the A Box button is your choice, but having the ability to change it from the A Box allows a change while on the road. 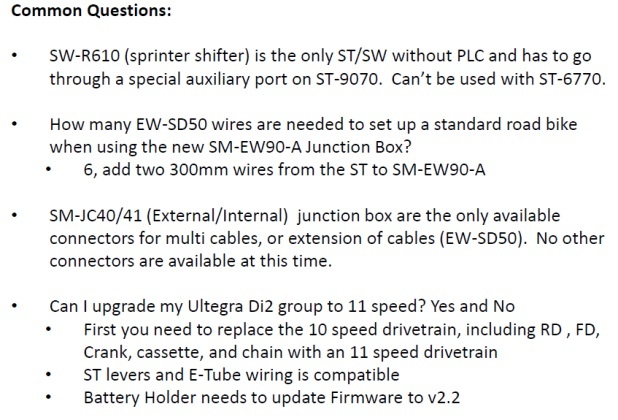 Despite I have all firmware updated (3.0 and above..), when I double click on the SM-EW90-A cable junction to change modes, the Green and Red indicator lights does not flash to indicate which Shift Mode I have selected….is there any incompatibility with my components? I did not see any on the “e-Tube Compatibility Chart”. Is it possible to change Shift modes, to set the Shift Mode via e-Tube software? I can only see that you can customize the modes, but not set modes from 0 to 1 and to 2 as you very well explained. And the last chance is to change the Shift Mode via e-Tube app, but as my wireless unit is SM-EWW01, only supports ANT+…and not bluetooth, so no chance neither! 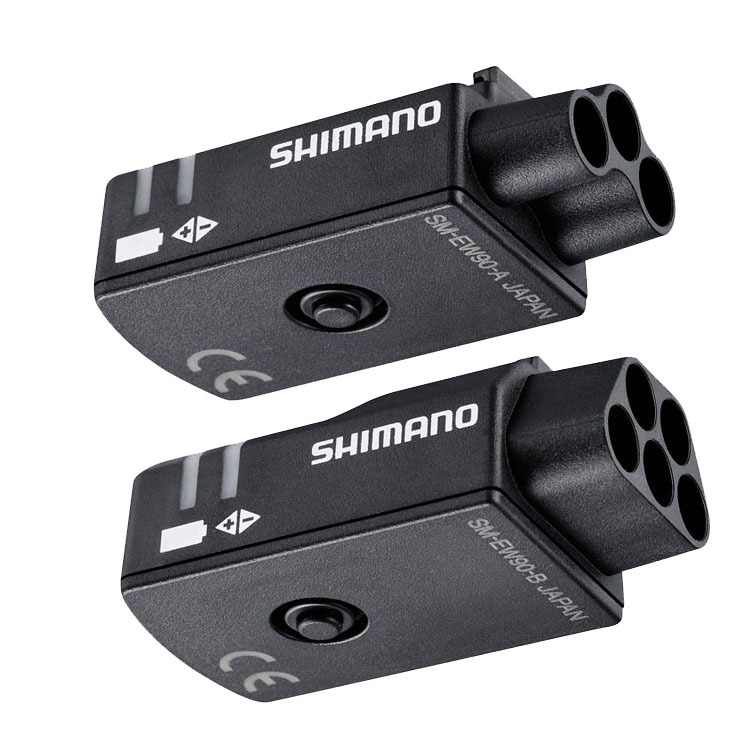 With the component combination you provided, there is a note in the compatibility chart under “DI2 with SM-BMR1/SM-BMR2/SM-BTR2”, “Limitation of function with SM-BMR1/SM-BMR2/SM-BTR2”, “*4 Synchronized shift is available only in MTB category”. As I read the chart, you would need to upgrade the battery to the newer BT-DN110 for Synchronized Shifting to work with you components. Oh! I am gonna need extra investment…battery, plus maybe also the my wireless unit SM-EWW01, that only supports ANT+…and after I could use this semi synchronized functionality and change the customizing from the cell phone. 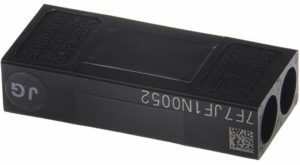 One last question: in the case I upgrade to the BT-DN110 Internal Battery, is it compatible with the rest of my components? 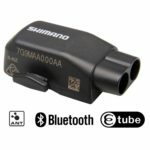 Will í be able to charge the battery as I normally do it through the SM-EW90-A Dura-Ace 3-Port Junction? And finally, I guess I will need the Shimano TL-EW02 Ultegra DI2 E-Tube Tool for installing the whole kit, correct? I finally changed the components, and I can now enjoy the 3 Shift Modes! Thanks for a great and super helpful website! Thought I would add some findings I had with my recent Di2 build. I had issues trying to connect my iPhone to the E-Tube iOS app. When connecting I was prompted to change the passkey, but every time I tried to enter a new passkey the app suddenly crashed. The solution was to go to Application settings and un-check “Verify that the screen for changing the initial PassKey displays.”. After that I could successfully connect through the app. Thanks for the info. Seems like a bug that the app doesn’t auto-detect no passkey being required. Set the the passkey using the PC app. I think it’s a good idea to prevent anyone from messing with your settings. I’ve had to lose the app then go into my iPhone settings and disconnect the WU-111 from the phones bluetooth list. Then go back into the app and try 000000 as the passcode. 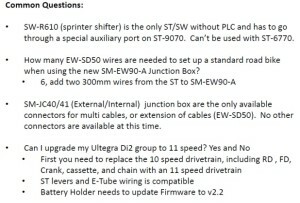 Hi Di2 experts, have I made a simple mistake… I’m currently upgrading my external Di2 to internal for a new frameset I’m buying. So far I’ve stripped down the old bike and I’ve connected all my new Di2 parts together outside of a frame to test (basically the whole system is connected together as it would be inside a frame but is currently sat on my floor). However, despite being a brand new battery, brand new junction boxes and brand new charger, the battery fails to charge! When I plug the new internal battery into the system I get a red light on junction box A for 1 second and I plug the charger in, I get no lights at all, none on the charger and none on the junction box A. The rear deraileur will move if I press the shifter buttons. I’ve plugged in my old external battery into the system and I get a green light for one second and both derailleurs shift, however the old battery is fully charged so won’t test the charger. I would be amazed (in a bad way) if the junction box A or charger has arrived broken when brand new and never used. I’ve noticed the internal battery has a metal tab on the outside, is this a negative terminal that needs connecting to anything? Am I doing something wrong ? Update… I’ve tried other plug sockets and other USB leads. Even on my Garmin 520 which charges ok. 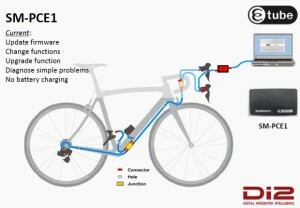 The fault lies between the Di2 charger box and the new internal battery. The detailleurs are moving fine and when I press the button on junction box A even goes into adjustment mode and crash protection reset mode. before you try and charge the battery you need to update all the the firmware including the charger. You need to plug everything together, plug the BCR2 into junction A, plug the charger into your PC than using etube project update the entire system. Pay attention the the system prompts as you may need to remove the BCR2 when if the software on your computer needs to update, and the BCR2 than the components. you cannot charge the battery with etube running… best to used a USB charger for charging. First be sure you have downloaded the latest version of etube project from Shimaino than update junction A alone, than updated the battery by itself, through junction A. Than the complete system. DI2DIY…. I have tried only having the junction(A) plugged into the BCR2 and its the same, “unit is not recognised” and the update firmware option is greyed out. 3.2.2 is the latest ver. Don’t know what to tell you. Perhaps you can find a LBS with a PCE1 to diagnose the problem. My initial thought would be a firmware incompatibility with this new internal battery and your other components. What is the battery version you have, SM-BTR2 (old ver) or BT-DN110(new ver). There are some functions and components that only work with the new BT-DN110. I’d suggest two options to start. 1) strip it down to the basics, A Box and Battery and try again. 2) Try to update the firmware. You may need to put the external battery on and upgrade all the components, then try the internal battery again. One last thought. if you are connected to the A Box and have e-Tube running, the battery will not charge. It doesn’t sound like this is your issue, but wanted to mention in. Jim, I originally used the BTR-1 external battery and the groupset worked fine. Im trying to upgrade it to the internal BT-DN110-1 battery. When I go onto the road bike page of E-tube Project… the Customise, Error Check, Update Firmware buttons are all greyed out. When I click on Connection Check the SM-BCR2 connects but then E-tube Project says the Master Unit and Junction A is not recognised. Ive tried to go into the Preset menu but this eventually says the units to write to could not be recognised. Or the units to read could not be recognised. Interestingly when I start E-Tube Project a window says charging was stopped, but theres no indications the battery was even charging anyway (the original fault). 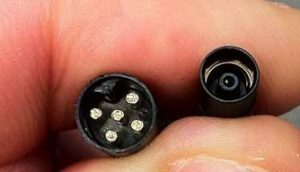 Be absolutely sure your Battery type and A Junction Box are compatible with the rest of your system. Pay particular attention to the *Notes at the bottom of each battery type section. This may help lead you to resolution. Until you successfully complete the “Connection Check” these options will be grayed out. The Master Unit is your battery. Carlton, what a website. Good on you! Question: I have Ultegra Di2 6870 series. I’d like to switch to a triathlon set-up without having to upgrade my whole groupset. 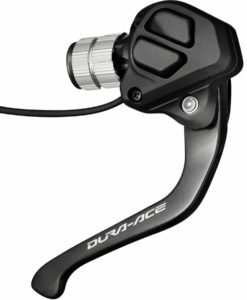 I have purchased regular DuraAce base-bar TT shifters and want to get either the DuraAce SW-R9160 TT shifters or the DA SW-R671 shifters. What are my options? I know regarding the latter I could use a B-junction to connect the two new wires into my existing SM-EW90 junction box. Would I need to upgrade anything else? Many thanks! Wonder if removing the 3.2.2 version and installing the 3.2.1 would make a difference? Might be worth a shot. I have run both version with no issues. … for which purpose junction A was made a mandatory component rather than optional? From an engineering perspective it should be fine to just strap battery (BT-DN110), motor unit (MU-S705) and shifters (ST-R785). 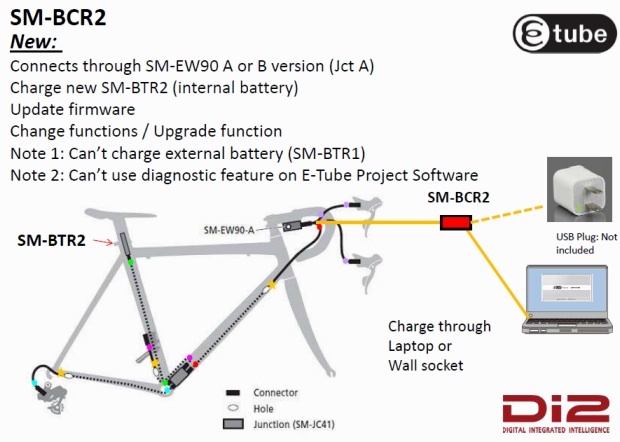 Even for charging I should be allowed to just undo my seat post and charge the battery directly from a (modified) SM-BCR2. … how @DI2DIY made his custom batteries work? I tried it myself but only saw the voltage drop to 1V. Do I have to disassemble an external battery holder and solder the electronics onto my large capacity batteries? … what are the signalling properties of the CAN in use? Symbol frequency? Levels? I saw some chatter with 1/4 and 1/2V swings on different baselines. I never decoded CAN before. Anyone can confirm that SM-EW67 is really limited to specific port usage? The only requirement for the A junction 67/90 is that it’s plug in to the system, it does not have to have anything plugged in to it, but can be plugged into any other components in any order. Hi I have a Durace DI2 10 Speed 7970 system and has always worked fine. A week ago the front dropped into the small chain ring and would not shift to the big chain ring. About 80kms later it started working normally. Yea, I had the same problem. Eventually the front derailleur stopped working altogether and then the back as well. Was due to the old wires getting moisture in them and corroding away. Suggest you take off the FD and test, if it works OK it’ll be corroded wires between the FD and gear levers. Lochearnhead did you manage to clean up the wires or able to source new one’s? Unfortunately I could not clean the wires or get new cables… they are almost impossible to get (at least in Australia). I bit the bullet and upgraded to 6870. 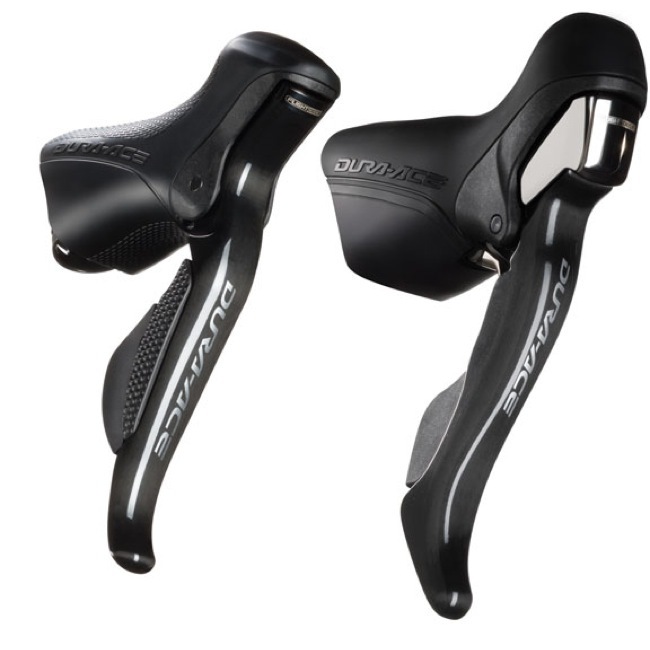 I have Ultegra Di2 10sp (Focus Chrono 2.0 2012 TT bike) with regular brake lever…(Tektro) The only shifters i have is the Aero-bar end SW-R671. 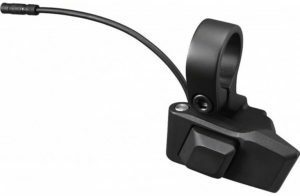 I really want to add only a right side – rear derailleur shifter (10sp) for out of the aerobar shifting (Climbs, corners, out of the saddle etc…) My junction box is 3 port (SM-EW90-A) and obviously full. 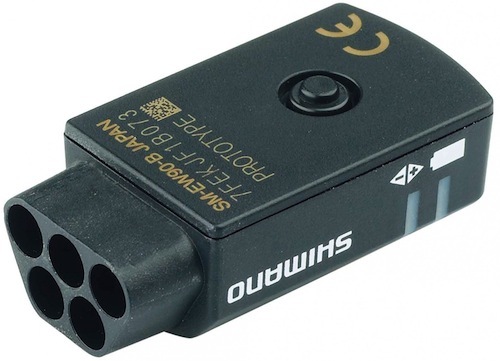 Do I have to buy this – “SM-EW90-B Dura-Ace 5-Port Junction” for the extra connection or can I attach the climbing shifter in a different way? Money is an issue so I would like to know what is my cheapest option… Thanks! Anyone? If it’s possible to do a manipulation with what i have currently I’d like to know…. My reading says you will need a 5 port junction box and then all will work. You could alternatively cut some wires and solder things together. If you need further instruction on the wire soldering method, then don’t do it. 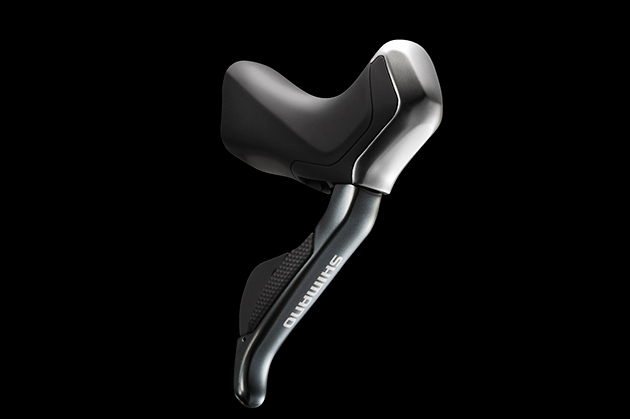 You might consider just buying an individual TT brake lever, which although is more money might well be aero cleaner. That’s correct, or you can use a Junction B to add more ports up front, which will be messier but possibly cheaper. How do I charge my battery pack when traveling in Europe ( from US)? You can connect the charger into any USB charger or your USB connection on your laptop or simply use the appropriate adapter and charge directly from the power supply, as Di2DiY suggests. This is a terrific post. Thank you for sharing. 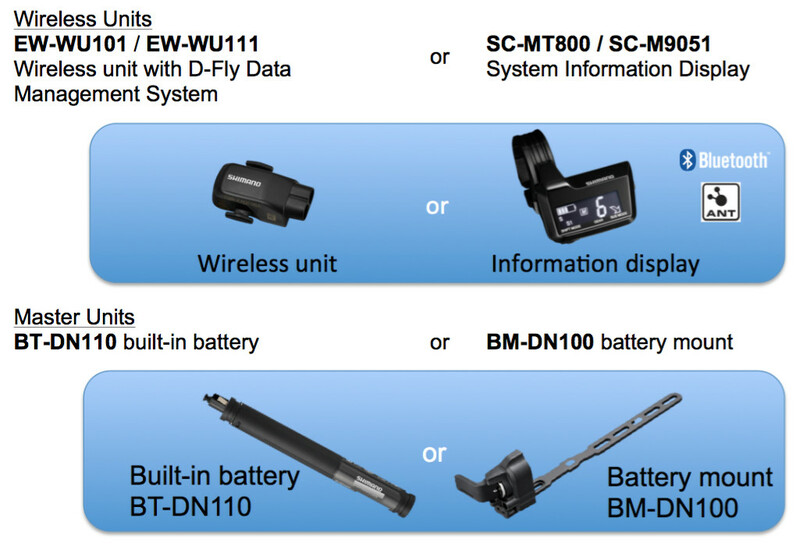 After reading all this, it would appear that there are no wireless options for D-fly and a SM-BMR1 – correct? it is in gear 4 on the bike but on the laptop I is saying its in gear 5 and how can I change this. I’m running Dura-ace DT-9070 Di2 with internal battery. The set-up works fine and I can enable syncro and semi-syncro modes via e-tube project. However in manual mode the RD refuses to change onto the smallest or second-smallest cogs when the FD is on the smaller cog. Is this a system design thing to stop cross-chaining? Can I override it? 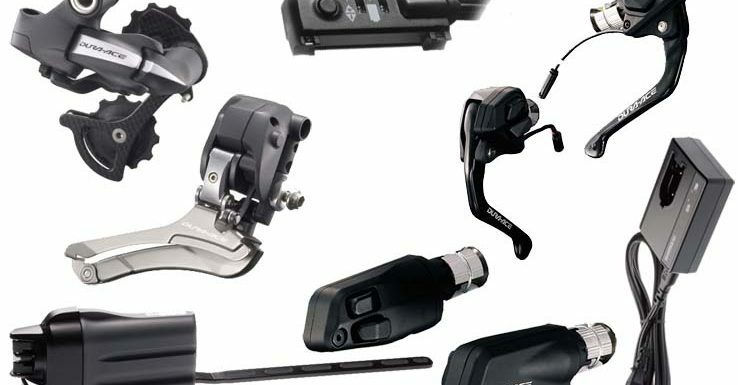 Hello Carlton and thanks for putting this page together for us who need a better understanding of how di2 works. I have a 2013 Caad10 Black Inc that came with Ultegra 6770 di2 and I’m in the process of upgrading the components to 11 speed Ultegra 8050 with an internal battery. I have purchased the new bar end junction box, new Bluetooth enabled internal battery, slim inline Bluetooth/ANT transmitter, charger, and several cables to connect everything. My question is, will everything I’ve purchased so far work with my existing Ultegra 6770 so I can ride until the new Ultegra 8050 components are available for purchase? Also, will my 6770 shifters work with the new 8050 group? 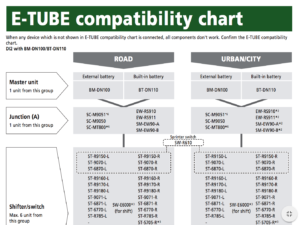 The best reference for your question is the “E-Tube Compatibility Chart”. The most recent is version 3.2.2, released on May 24, 2017. To help address your question, I will make the following parts assumptions. 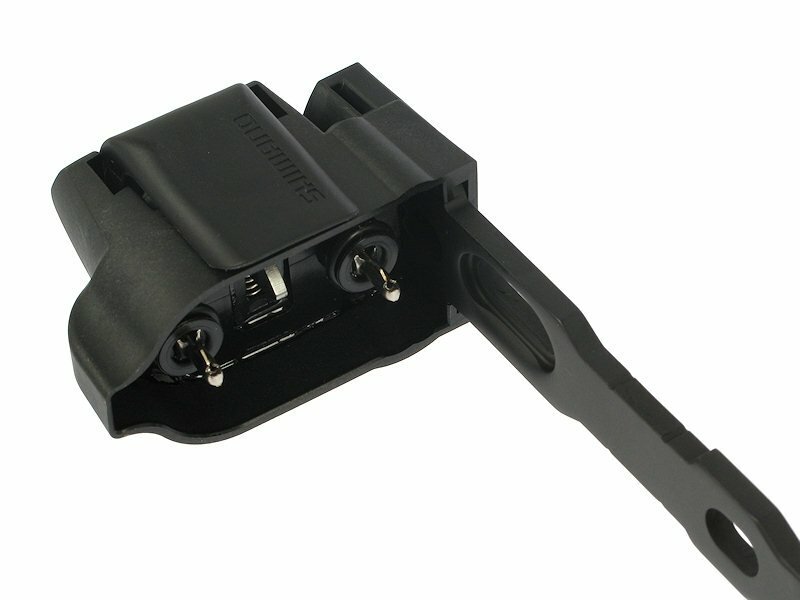 The Bar End Junction is an EW-RS910, Internal Battery is a BT-DN110 and BT/ANT unit is an EW-WU111. You didn’t mention what model the existing shifters are. Based on the compatibility chart, all of your new components should work with your 6770 derailuers as long as the shifters are compatible. I assume you are using the RS110 Bar End junction box with the intention to route all cables internal. Routing cables inside the bars can be challenging. Many bars have reinforcements built in them between the drops and hoods making cable routing more difficult than it seems on the surface. A number of newer bars are available to address this issue. Thanks Jim, I plan to use all of the new parts you listed above with my existing 6770 shifters if they’ll play nice with everything else. 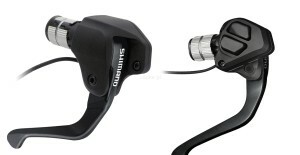 If not, it’ll give me a reason to buy the new R8050’s which have some new features that look nice. I’ll also admit I’m only hopeful at this point to be able to route the wires internally with my existing bars as I haven’t tried to pass a fish wire through them yet. If the wires will pass, it seems I can make things look pretty neat with only one wire leading to the frame in place of the old SM-EW67A-E junction. If not, I’ll be in search of some new bars. So far I only see Pro Vibe’s being available for internal di2 routing, what are some other brand bars to looking for? Just a followup on my installation of the bar end junction EW-RS910, Internal Bluetooth Battery BT-DN110-1, and inline Bluetooth Transmitter EW-WU111. Installed everything yesterday and it worked right out of the box with my Ultegra 6770 10 speed shifters and 6770 Front/Rear Derailleurs. 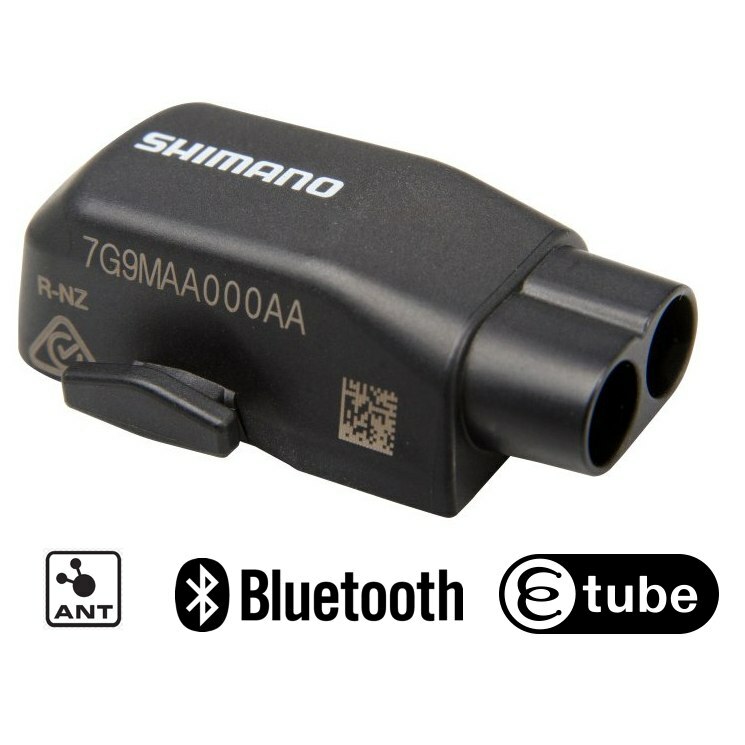 I also updated the firmware on all of my components to the latest versions using Shimano’s etube app on my cell phone via Bluetooth, pretty cool! 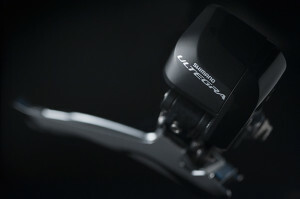 Anyone have any idea as to when Shimano is going to release the new Ultegra R8050 di2 components? They were scheduled to be in stock at a few online shops yesterday but now the dates are being pushed back anywhere from the end of August to November. Dave. Glad this all went well. I really like my Di2 setup, the crisp clean shifts are great, the only downside to me is the cost and remembering to charge the battery a couple times each riding season. No issues routing the cables through your bars? No problems, ended up looking pretty clean. Only thing you see up front is the inline Bluetooth unit but its hidden pretty well below the stem. I used some heat shrink to run the etube wire along with the rear brake cable where it goes into the frame. I did drill some holes as a temporary solution just below the shifter clamps to run the wires and the tape hides everything. I do plan to get the new Pro Vibe bars when they become available. I placed my EW-WU111 Bluetooth unit just below the battery in the seat tube. It worked out fine in my carbon frame, but have heard about issues doing this on a metal frame. Yeah, that’s why mine is external for now as my bike is a Caad10. I had a carbon drop bar on it but decided to put the original C1 aluminum bar back on to drill holes for the new di2 setup just to be safe. Once I get the new PRO Vibe carbon bar, I’ll be able to stuff the EW-WU111 inside one end where it should work just fine. Anyone with a newer internal battery BT DN110, capable of an accurate diameter measurement? Preferably with vernier calipers. I need to know the diameter of the bare battery without the fitting shims. I’m trying to squeeze one inside a vintage USE titanium post, on an equally vintage ’89 Merlin ‘road’, which is narrow at best. Otherwise I’ll have to bury it in the seatube, but the bottle cage bolt inserts look like they will be in the way. Any help greatly appreciated before I dive in and order one only to find it doesn’t fit. I measured 17mm diameter for BT DN110. Thanks Carlton, sorry for the slow response on my part! 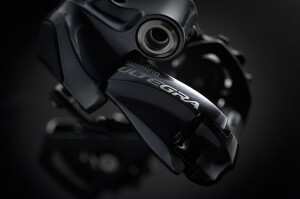 Is it possible to install Ultegra Di2 front derailleur so I can run 50-34t front or is it bad to mix ultegra with MTB XT di2? The rear XT derailleur is awesome atm but I want higher gears for gravel and paveroads also. If possible any firmware recommended? 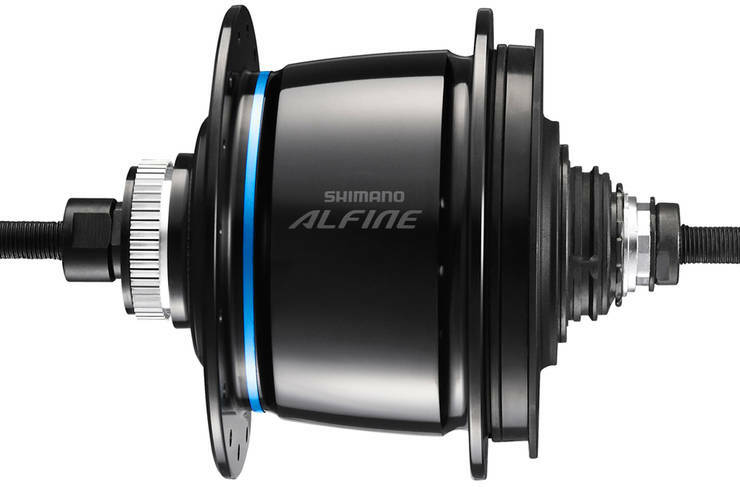 I’ve wondered if the limitation on mixing Road and Mtn Di2 was some mechanical limitation or because Shimano chooses not to make it work by firmware? I’m pretty sure it’s a firmware issue to limit liability. You can’t run a mountain FD with the larger chainring as it is a mechanical issue I believe. I have an XTR FD on a road compact crankset. It works well, if not quite as smoothly as the ultegra FD. It is annoying you can’t mix these, I have a bike that I use as a road bike for big long trips where I want the 50T front ring, but I also use as a gravel bike and want the clutch rear mech and extra range. 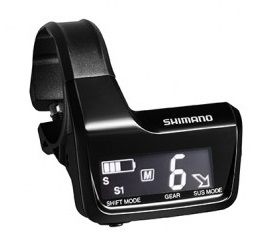 Seems to be its gotta be firmware and they could choose to make them compatible with firmware if Shimano wanted to. I can’t think of a technical mechanical reason why the mtn rear and road front couldn’t talk and work with each other as long as one doesn’t cross chain too much. If I use a 32 on my rear Dura Ace Di2 and am inadvertently cross chained with the compact 50 big ring, I get chain rub on the top of the front derailleur cage (smaller bike lower bottom bracket). I can move the FD a bit higher to avoid this but but then shifting isn’t quite as awesome and there is no good reason to cross chain. But synchro shift takes care of all this (it’s awesome). So with synchro shift it should be possible for a rear Mtn Di2 and Front Road Di2 to work without getting into trim or chain rub issues if firmware allowed it. 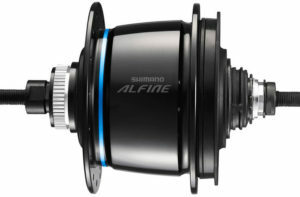 For my sins, I have the Alfine Di2 11 speed hub and cannot get it to reliably engage 10th and 11th gears. Everything has been updated, I have performed an oil change and tried every available adjustment to the motor. Any ideas? Also, can you tell me what the little “M” means on the display (as shown on your MT800 image)? Just upgraded to Di2 on my new Cannondale Synapse. Very grateful for the information you have put together. Grazie Mille! Hi Carlton, Thanks to your instructions, I made my 6770 Ultegra 11 speed with the addition of the RD6870 and old software version update and it worked great. Just replaced old battery with a new SM-BTR1 and to my relief it’s still 11 speed. I wanted to add the R600 climbing shifter, so plugged it in to ST-6770 and it doesn’t work. Is this because Ive got the SM-EW67-A-E Ultegra 3-Cable Junction? and if so, do I need the SM-EW90-A Dura-Ace 3-Port Junction to make it work? Thanks in advance, I had a look through previous comments but may have missed a similar question. 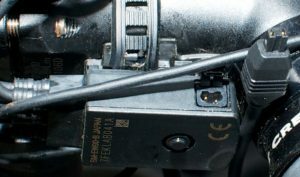 First, unplug an existing shifter and plug the climbing shifter directly into the 3-port junction and see if it works. 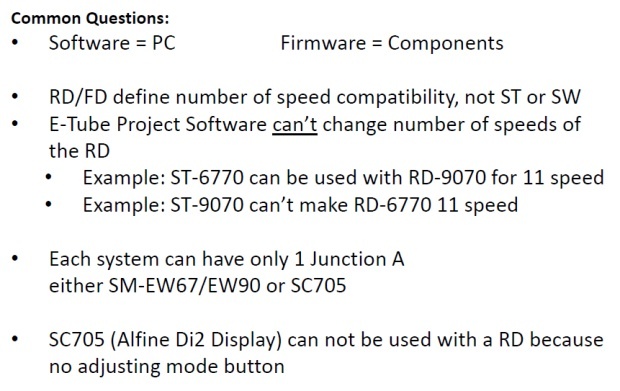 Second, you may need to downgrade the firmware to match your other components. 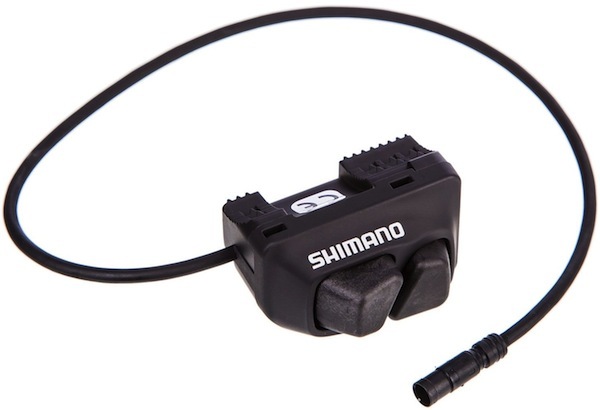 I can’t remember off the top of my head if the ST-6770 has a sprint shifter only port. If so, then the climbing shifter wouldn’t work. Thanks, I’ll get hold of a 3port junction and try it. Didn’t have the 3 port junction, so bit the bullet and bought the FD-6870 to see if it would work. Still no luck so got a friend with the pce1 to update all firmware to current and sure enough the r600 and everything works well. Thanks again for your help. Hi Carlton, a few questions, once the bike is set up and shifting does the junction A need to be on the bike i.e. can it be shared between bikes or are bike specific derailleur settings stored on it? Instead of the junction B could the wires be soldered together? Are there any non Shimano 8.4v DC 0.4A chargers that a EW SP50 wire can be spliced onto? Many thanks. I am curious if I can charge the BTR1 battery through a hack? I do not want to spend the money on an external charger as my old one just broke. Any help appreciated I have a BCR2 and EW90A from another bike I can cut up, but I don’t think it will work. Is there a dc voltage I can set and attach wires to on the BTR1 from another charger? Were you successful? 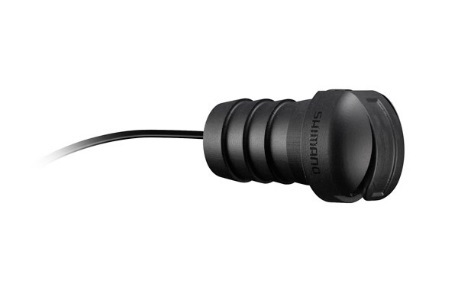 Similarly I want to have a small battery pack (7.4v) that I can plug into the charging port in an emergency situation (forgetting to charge), however the odd duck connector of the charging port has me stumped. Any idea if there is a suitable connector on the market? It can ONLY be charged with the BCR2 charger, but you can plug a USB battery backup into the BCR2 to charge, so you would not need an AC outlet. Check the battery level regularly and there will be no emergency. For the original post, you can not charge a BTR1 with a BCR2. Thanks again, yeah eapathome gave me a heads up about the charger chip communicating with the battery chip to open the gate for current to pass. And yes, I need to be more diligent in charging. I’m the same person. I’m a contributor on Carlton’s site. Firs, thanks for all you have done. I have put three Di2 systems together with your help. My current system, however, is perplexing me. It’s the newer 9150 FD and RD, with the non-series 785 brifters. Bar end junction A, internal B. Blue Tooth enabled. I ride with cross chainrings in 36/46 and usually a 12-25 cassette. For some reason I cannot get my E-Tube program to allow me to set those chainrings. I can create a profile for it, but the program displays a red warning symbol and says that such gearing is not allowed on my bike, So, I lie to it and tell it I’m running a 34/50. It works, but the situation is perplexing. I also note that it oddly keeps me from the two smallest cogs (can get to neither the 12 nor the 13) when in the small ring. Nothing I do will get it to let me run further down the cassette. I can understand it disallowing the full-on cross-chained situation of (what it thinks is the) 34-12, but I’m perplexed that it disallows (what it thinks is) the 34-13 WHILE it allows me to get into (what it thinks is) the 50-23, which is a worse state of cross chaining than the 34-13. Can you comment on any of this? I have a question if you have a moment. I bought my bike with Ultegra DI2 from a local dealer in March 2014. Initially I let the shop take care of the setup and left things alone. This last year however I’ve become more hands on and what I’ve realised relates to your section “Adjusting the Rear Derailleur Trim” where you say there are plus/minus 15 adjustments. For whatever reason mine is way over to one extreme, so I’ve got maybe plus 1 or minus 29! I asked at the shop about this and they just replied that “some of them are like that”. Now, that could be. I mean the shifting is fine and never needs adjusting, but even so, I would be more comfortable if the neutral position had been somewhere in the middle of the range. Incidently I have two sets of wheels and the issue is unchanged whether I mount the same cassette on either wheel. 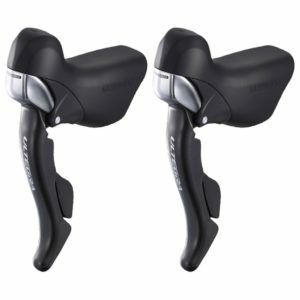 Has anybody hacked SRAM Blip shifters to work with Di2 instead of using Shimano climbing shifter buttons? I have fitted the SW-9150 climbing buttons (which look like blips). I have these direct into the A junction. Building a Di2 TT bike and want to get my cables sorted. Need the four and already have the frame so I can measure up. Using your wire 3-6 convention from the article how much length do I need to allow on the end of the 3 wires that exit the frame (connection to Junction A and both derailleurs). Just in the process of setting up a full set up n a Cervelo P5 with Magura hydraulic brakes. Started playing with the E-tube App via an IPad. If I set the “S1” to synchronised setting, front and back mechs sort themselves out. If I return to “normal” mode, there is no changing of the front mech (just auto trimming) So whatever ring it was in when I change mode, it stays there. So what setting is there to manually change the front mech when in “normal” mode”??? Have you assigned buttons/shifters to actually change the front mech in manual mode? Does it work normally before you select Syncho shift, if so stick with it and don’t bother with syncho if you are going to use manual mode. 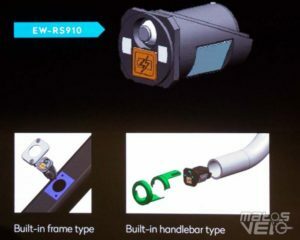 There is no option shown in the App to allow operation of the front mech (not seen anything yet – Perhaps there is more options with the PC software???). I would have expected that pressing both buttons together would allow the front mech to simply alternate between rings, but nothing showing. The synchro shift looks good on paper, and may work quite well on the road, but there are occasions (impending inclines) where moving the front mech is all that is required. Certainly appears to require a reasonable cadence when doing the synchro shift as there is a lot of chain movement going on within a short space of time. -Can I substitute R671 2-button shifters for R9160? -How/where did you add the R600 button? What junction box is it plugged into (wouldn’t the other shifters take up all available ports? I set up with the r9150 buttons on the magura brakes. Car rear view mirror double sided pads hold Them in position ok. The 9160 single buttons would work fine. Using single buttons makes everything simple to understand and I set mine to JUST control the rear mech. Using Synchro shift to control the front. The R600 was mounted on the stem to give me the option to shift the front mech whenever I wanted. Not sure if this is allowed, but this was my set up on the bars. Excellent outside-the-box thinking on that setup; thank you for sharing that. Would you be able to post a picture of the front-end setup? I would be interested in seeing both the manner in which you mounted the R1950’s to the Magura’s as well as the R600 mount. This has been a very helpful post but I’m still a bit stuck and wondering if you can offer some direction. 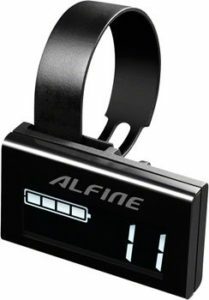 The bike did not originally come with the wireless unit but I added it about 3 months ago (1 month after purchase) and it’s worked fine for those three months except I was never able to get my phone to connect to it (Android S8+) although the Garmin Edge 510 always connected fine. I wasn’t too worried about that and just assumed it was some incompatibility with the latest Android phone/OS. Last night I got antsy though and wanted to figure out why the phone wouldn’t connect, plus it was time to charge my battery anyway. I connected up my SM-BCR2 between the comptuer and SM-EW90-A junction and let the system charge to 100%. Once at 100% I opened e-Tube on my PC and hit the Update Firmware button. It updated fine and said something along the lines of only being able to update the EW-WU111 via the phone app. Seeing that all the other components updated successfully I disconnected the SM-BCR2 from the bike and proceeded to do as instructed – connect via the phone app to try and update the EW-WU111. This time, for the first time ever, my phone connected successfully and I proceeded to upgrade the firmware on the EW-WU111 via the phone e-Tube app. However, halfway through the upgrade it failed and didn’t say anything more than it had an error during upgrade. Is my best/only option at this point to take it to the shop or otherwise find someone with the SM-PCE1 to troubleshoot the wireless unit on it’s own separate from the rest of the system since the SM-BCR2 won’t allow me to do that? Any help is much appreciated! Eww, I’m sorry, the paragraphs didn’t come through on that post so it’s a big chunk of text. Something you might try is to disconnect the battery for 5 to 10 minutes, then try again to see if it will reset.or clear. If that doesn’t work, try removing the wu111 from your system so the system no longer sees it as a component. Then connect it back in. Beyond these steps, you are likely looking at you LBS or someone with a SM-PCE1 to troubleshoot. I had that issue yesterday when setting up my EW-Wireless unit. Turned out that when I changed the Bluetooth password (as recommended), this was correct between the E-Tube software and the unit, but my Ipad Bluetooth APP was stuck with the original “000000”. it was suggested to delete the pairing from the ipad and allow a new pairing. No issues after that. Thanks James and Stephen. I disconnected the EW-WU111 for an hour or two during dinner and then reconnected it back up just now. I connected to the computer but the computer still won’t recognize the EW-WU111. I also tried deleting the pairing on my phone and then reinstating it. It successfully asked for the passcode and I put in the new one (the one I had previously set in the e-Tube project on my PC) and it paired successfully (at least from the phone’s view). However, the e-Tube Project app on the phone still would not connect. So that tells me it is broadcasting a bluetooth signal but something with the Di2 system is not letting it communicate. Additionally, the junction box does not go into Bluetooth mode (where the two lights alternate back and forth) so it’s as if the junction box doesn’t even recognize that it’s there either. Lastly, I removed the EW-WU111 completely from the system and left it for a bit, confirming that all the shifting worked. Then I put it back in as if installing it from scratch and still have the same problems. I found a posting on eBay to hire a SM-PCE1 for £10 and that should arrive tomorrow and the next day. From there I plan to do a direct connection with it to the EW-WU111 to see if that can update or rollback the firmware on that specific component. It’s my last resort before assuming that the wireless unit is bricked from the failed firmware upgrade earlier today 🙁 Thank you all for the suggestions. If there are others, please chime in! I think, You should press the button on the junction box for a very short period (0.5 sec). If you press longer, then it goes into setting the shifting mode. Thanks for the comment Ravi, but that wasn’t the issue in my case. A couple of last suggestions. 1) Check with some LBS and see if you can find one who has a mechanic trained on Di2 and with some experience. 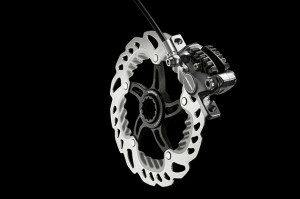 I have found a shop in my area with 2 good Di2 folks and they are very willing to assist, not that all shops will be. 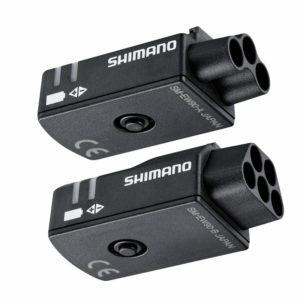 2) Contact Shimano Customer Care and see if they can point you in the right direction. A side note. If possible, try reapplying the firmware update to the battery without the EW-WU111 installed . I know this sounds odd, but it’s my understanding and base on my experience, this is where the brains are kept. If the firmware is not right on the battery, the BT won’t work. Worth a shot. I wrote up what I did on another forum where I had requested help and the comment editor on this site doesn’t really let me paste it very well so I’ll just put the link to that other site here: https://forums.garmin.com/forum/into-sports/cycling/edge-520-aa/149279-?p=1251163#post1251163 posted as cbass94 for those that want some bedtime reading. Anyway, I hope this helps someone at some point. Thanks again for the help everyone. (2) If I set program S1 to be semi-synchro and to downshift / upshift 2 rear cogs when the chainring is shifted, will that still function if I activate S2 which is a fully synchro setting? It seems like “shift the rear (2) bigger when I change to the larger chainring is still a valid desire even in a fully synchro program. What do you think? Newbie to Di2 here, looking for help. I fear that my MT800 display unit got bricked during a firmware update. I recently bought a shop-built bike with Di2 already built in. It’s an 11-speed 1x drivetrain with M8050 rear derailleur, a battery fitted inside the seat tube (not sure which model no. ), the R600 climbing shifter and the MT800 display unit. When I got it home, I connected to Bluetooth using my iPhone with the eTube app, changed my passcode, and all was fine. Then the app said it needed to update the Di2’s firmware, so I put the phone down next to the bike and let it run. A minute later I looked again and the app said there was a connection error (or something, I don’t remember exactly) but now the display unit is totally dead. There is no readout on the display, shifting doesn’t work, pressing the function button on the display does nothing. I’m stuck in one gear. The bike was almost fully charged when I got it, so I don’t think it’s a battery issue. My fear is that the connection failing mid-update has bricked the display unit. The bike is back at the shop now while they investigate but they’re not very familiar with Di2 issues, so I thought I’d ask here. Could the display unit be brought back to life by re-installing the firmware, maybe by connecting it to a PC? It sounds like it’s similar to what happened with my EW-WU111 (see post above). In my case I had to use a combination of the SM-PCE1 and the iPad app’s Error Check function to get mine to finally work. Another newbie here. Suggest to disconnect every other device so that only the EW-WU111, Battery and MT800 are connected (and Junction-A if required) are connected. This should allow you to error check/update the MT800 without the buttons and mechs having any rogue influence. I had the same problem after changing my Bluetooth passcode. The Etube app and the EW-WU111 had updated to “mynewpasscode”, but the IPAD Bluetooth was still trying to connect using “000000”. Solution was to remove the pairing in the IPAD/Iphone and then let it find itself again. give this a try before anything else. That will usually pull the Di2 wire out of the shifter/brake hood just enough to disconnect it. 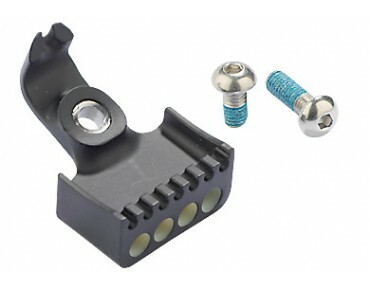 You’ll have to unwrap your bars a bit to get a little extra slack on the wire and re-seat it into it’s plug/port. Then all should be good for you again. 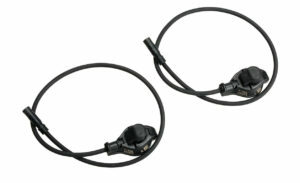 Shimano instructions for Di2 fitment say to leave a small loop of slack cable so that if the hoods move by a few mm, say when you hit a bump, the cable doesn’t get pulled out of the socket. Good news. The shop had the diagnostic hardware so they were able to connect to the display unit which brought it back to life. Then it was just a matter of me re-installing the firmware from my phone. Now I can finally ride my new bike! Great resource Carlton, thanks for creating this place to “chat” with other di2 people.. I have just finished doing the cabling for a fully internal di2 setup on my Cervelo P2 (converting an external setup). The last piece to my puzzle is to make the battery internal (I currently have the external battery). 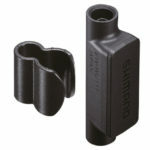 Before shelling out the $ for the Shimano internal battery, I plan to make my own. Making and wiring the battery is easy enough, but my question lies with the CANbus. What do I lose if I wire up the battery without the CANbus chip? I’m trying to decide if I need to “hack” the SM-BMR2 External Battery Mount to get the chip included in my wiring. 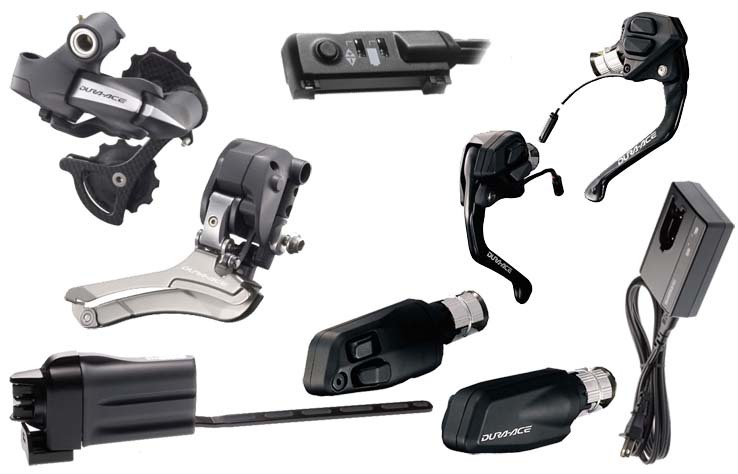 Yes, you will need the Di2 chip for your battery to work. 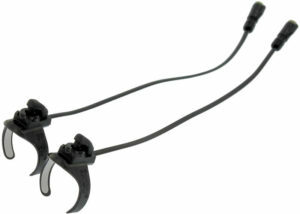 Di2diy was selling these on ebay but I don’t see any there now. My advise is to buy the Shimano internal battery for future firmware and charging compatibility. I’m stuck here in Europe for the last few months, but I agree, but the battery, it’s not an easy hack. Thanks for the replies guys.. Appreciate the advice, will look into buying the internal battery. Hi there. not meaning to change the topic….but anyone out there with external batteries running down in couple days without use? On a new battery…ran a diag and no issues with any of the mechs…new battery drains just as fast 48hrs…Was looking for the thread but to no avail. 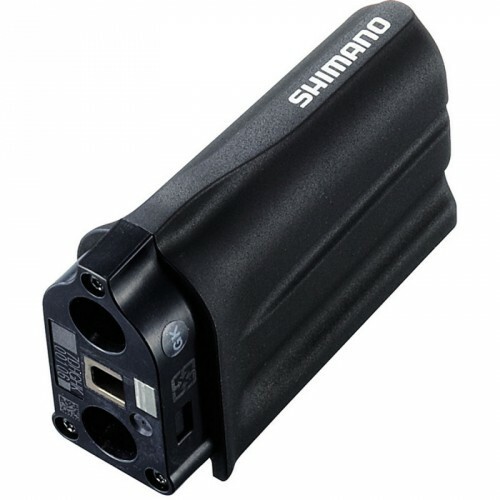 Update your firmware to the latest version using the Shimano PC software. Otherwise, you have a short in the wiring somewhere…or a bad cimpinent. 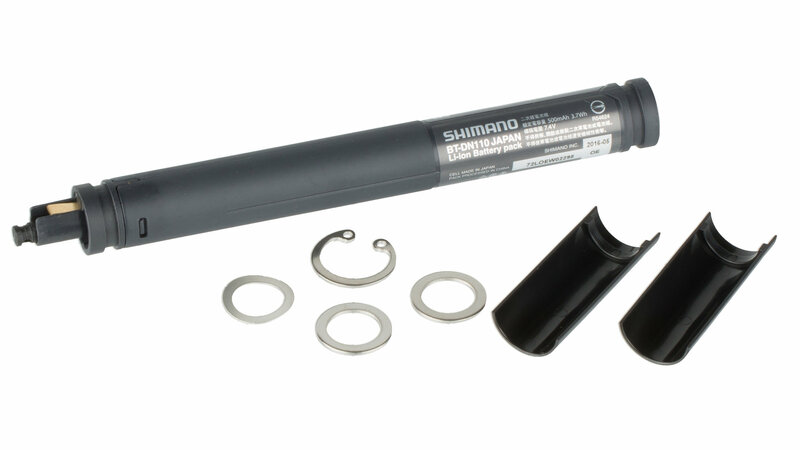 I do still have kits for the E-TUBE seat post setup’s but it only make sense it you want to keep using the SM-EW67, and most people are using the EW90, so sales have dropped off so I stopped selling them. If someone wants to buy one for use with EW67 contact me here, otherwise just buy the Shimaino setup. 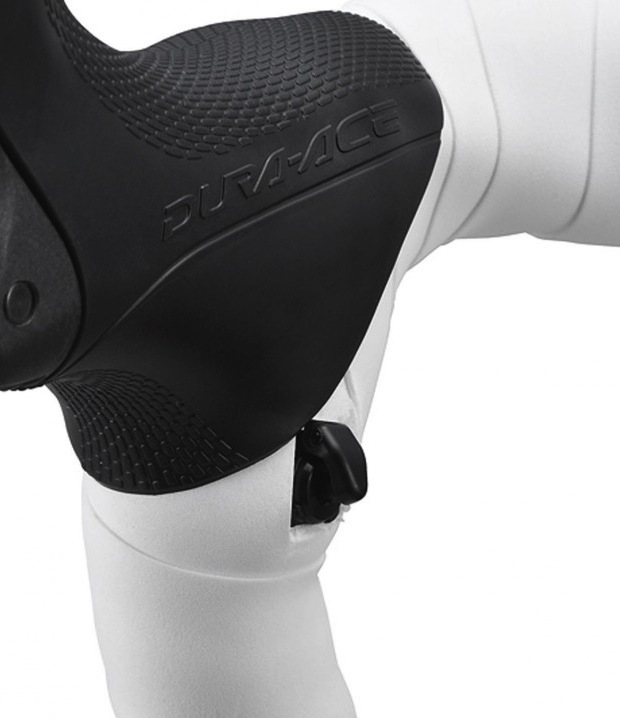 Great site this, i need some advice, i bought a used BMC TT bike with Dura ace Di2, it has an internal battery that requires removing to charge. I charged batter and checked it and light was green, however after 3 days and no use the battery is now totally dead, no shifting at all. I did notice when i took it out before this that when in the front big ring and the rear big ring the front mech gearing changed to the inner ring without me doing anything? I am wondering if the front mech is out of sync resulting in using power when not in use? I have read elsewhere that this is possible? Any advice would help? You should never be in “big-big” of “small-small”. You may be putting side-load on the mech and the mech is trying to constantly hold position, draining the battery. I use big-big and small-small every day and have had ZERO issues. I do this with cable shift, di2 and eps. bib-big is much more frequent than small-small. In all cases it is not for long distances. Get over this stupidity, bicycle snobs. I usually don’t but I just wondered if with the mech shifting would this be a possible indication that the front mech is needing adjusted? I am trying to find out why the bike fully charged and then after 3 days of no use the battery was discharged, the gearing when left was in big ring and middle of rear cassette. If you hit a shift lever inadvertently after riding, the derailleur motor can be working hard and quietly to shift or something doesnt sleep when this happens which can drain the battery. I think this happened to me once. I did find that my Di2 system did discharge in a couple days when I left it in synchronous mode when I had an older version of the firmware loaded. With the latest firmware, it corrected the issue. The advice about the battery is extremely helpful – I charged mine one day, and it was dead a couple days later. Probably because I inadvertently pressed a shift button. Thanks! Ok finally got to hook my bike up to the E tube software, looks like I need a firmware update, however I am getting an error message now noting that a unit is not working normally, its asking me to disconnect all units other than ST-9071-L, any ideas how I can do this? 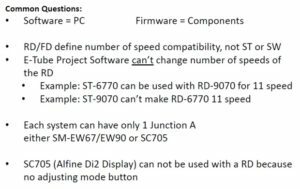 can I use the TT components ST-7971 an SW-7971 with the RD and FD 6770? Doh! You’re right. Those are old the 4-wire/5-wire variety. Definitely not compatible, as the article above clearly states. Hope someone can help I had to remove my di2 groupset from my frame to get a crack in the carbon repaired. When I reconnected the groupset after the repair it all started to go wrong – the system would not shift, so I connected it to etube where all the components showed up with up to date firmware, except the ewwu111 wireless unit which needed an update via the etube android app. Now the shifting is still not working and the button on the ew90-b is now not functioning – no lights showing when depressed. Have connected to etube where it finds all the components – still no shifting or functioning ew90-b. You have likely resolved this by now – what worked for you? Thanks for this site – helped me get thru my update challenges. This site has been very helpful in my understanding DI2! My LBS built me a road bike last year and used DI2 to enable using a large MTB cassette to get some very low gearing to enable me to cope with the hills. All fine until the first part of this year when occasional misting of the display unit started. Not happy with moisture and electrics being together but LBS said nothing to worry about. When I lost the ability to change front or back gears on a ride despite having a well charged battery I was able to ‘encourage’ the system back to life by constantly pressing up down alternately on both shifters and after about 20 minutes the system came back to life! LBS ran diagnostics and couldn’t find anything wrong. 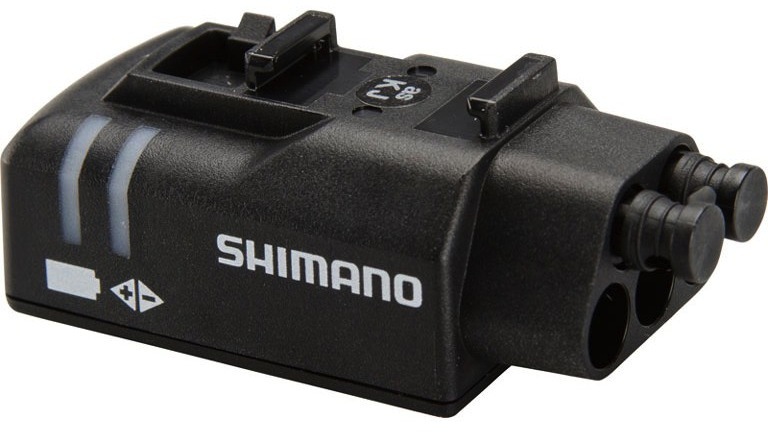 I asked for the system to be returned to Shimano and after 2 months they eventually said no fault found but they did replace the display to the current blue tooth version but I had to pay for a new model battery to use with the new display. All fine up to October when I noticed sudden drop in battery as shown on the display. Re-charged but fast draining occurred again. LBS ran diagnostics and couldn’t find anything wrong. Suggested it might be due to leaning the bike against the wall in my garage activating the shifter controls. Bought a bike stand but problem re-occoured. Back to LBS who could find no problem. On collecting bike told battery had been fully charged in the shop, diagnostics run and system road tested with no fault. On collecting the bike display showed 3 out of 5 bars charge on display unit. Next day this had dropped to 2 units (bike ridden 18 miles), next day first thing the display had dropped to 1 unit and by the afternoon this had dropped to zero and no controls were functioning. Back to LBS no fault found and the system including wiring returned to Shimano and at present awaiting a response from them. Have lost the use of the bike for weeks at a time since October and at the moment looking at not getting it back until after Christmas! Firstly, apologies for this long posting but I thought at least the tale might be interesting. Any thoughts on what might be the problem would be appreciated. Can’t get my head round a battery that should only need to be charged 3 or 4 times a year can discharge from 3/5 to 0/5 in a dry weatherproof garage in 3 days when the bike is only ridden 18 miles. LBS attitude is a shrug of the shoulders and the comment ‘we cannot find any fault’. From the description I would replace the battery. The failure mode sounds like one of the cells has started to fail and degrades after each charge. I make and sell custom seat post battery systems and this happens to lithium ion batteries and there is no way to detect it except it degrades over time. If it’s the battery, soon it will not even take a charge, or will charge continuously. The leaning of the bike is bogus, the shift buttons are momentary switches, and do not stay open unless they fail. Thanks for your thoughts. Still waiting to hear from Shimano via the LBS. Hopefully they will arrive at the same conclusion and replace the battery. I will post their response when I have it.